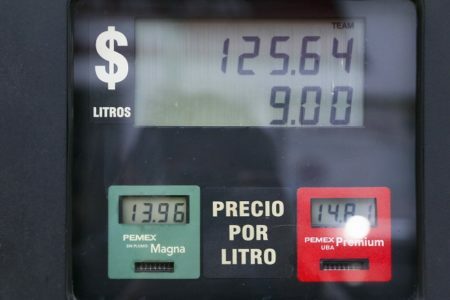 HOUSTON — Mexico’s finance ministry is looking at ways to “soften” the price impact of gasoline market liberalization next year, Energy Minister Pedro Joaquin Coldwell said on Tuesday Nov. 14 following a meeting of North American energy ministers in Houston. Reuters reported that some independent fuel importers recently have complained about a lack of tax adjustments to reflect the at least 15 percent increase in recent weeks in international prices of gasoline and diesel, the two main refined products imported by Mexico. Coldwell said through an interpreter that a tax mechanism will be designed “for softening these prices. This protects the Mexican consumer from abrupt increase in prices.” He did not elaborate on the changes. Gas prices are climbing in Mexico. Coldwell said overall energy reform efforts are benefiting Mexico’s consumers, bringing wider choices for the first time in gasoline quality and brands. The market reform ended the monopoly national oil company Pemex once enjoyed in everything from crude production to retail sales, paving way for international oil companies including Royal Dutch Shell Plc, BP Plc and Exxon Mobil Corp to enter the retail market. “Before we had only one brand for retail gasoline stations. Now we have 30,” Coldwell said.